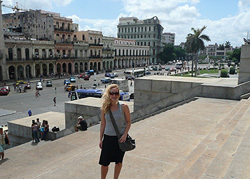 My name is Jessica and at the beginning of 2008, I spent 6 weeks living in Havana, Cuba. I had the time of my life! 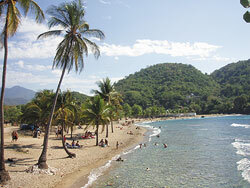 I arrived in Havana at the end of March, which was an excellent time to go, because the weather was perfect. My host family came to pick me up, and brought me back to a nice apartment in west Vedado, an area just bordering the district of Miramar. There was a girl from England staying in the room next to mine, and over the course of our time in Cuba, we became great friends! I always dreamed of going to the Caribbean because of the beaches but after my trip to Havana, I now know that Cuba has so much more to offer than just sunbathing! As soon as I started walking around Havana I felt as if I was in a different world – the combination of old cars on the street, colonial buildings and the sound of salsa… It’s just so different from any other place in the world! 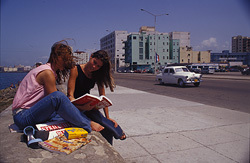 There are a lot of interesting places to visit in Havana but Vedado it is definitely the best area to stay. It is a lively neighbourhood with nice homes and a lot of activity; the real centre of the city… and this is where my Cuban host family lived and where I also had my Spanish course! The teachers were really friendly, patient, and obviously had lots of experience of teaching Spanish, because they really know how to help you learn, but make sure you enjoyed it at the same time – and with just 2 other people n the same group as me, we could always ask the teacher if there was anything we didn’t understand.